Freshwater availability is critical for human survival, and its availability in the Arabian Peninsula in the past was likely to have been a primary control upon routes and opportunities for the movement and dispersal of early humans. With this in mind, Palaeodeserts team member Paul Breeze developed new palaeohydrological methods during his doctoral research. 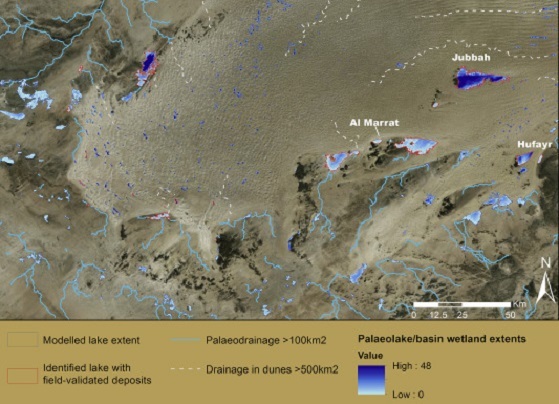 Remote sensing and GIS techniques were used to map palaeochannels (ancient water channels) across the whole of the Arabian Peninsula, and palaeolakes and marshes for select regions covering approximately 10% of its surface area. Field survey by the Palaeodeserts team in the Nefud desert and the Dawadmi and Shuwaymis regions of Saudi Arabia has indicated accuracies of 86% for the palaeodrainage mapping, and of 96% for the method for identifying former palaeolake basins. These data are now being used by the project for targeted field survey, as the new palaeolake mapping method has also demonstrated potential for identifying surface and stratified archaeological site locations, with 76% of the surveyed palaeolake basins containing archaeological material, including stratified Palaeolithic archaeology. Read more in Remote sensing and GIS techniques for reconstructing Arabian palaeohydrology and identifying archaeological sites in Quaternary International.